The clock is ticking for the lovers and the loved ones. Valentine’s Day is here again. Are you wondering about how best to express your love? Indeed it can be overwhelming at times for many, especially for men. We at Taarifa are not experts in love affairs nor can we claim to be the best advisors on this subject as old as the universe. The little we can do, however, is we have managed to put together a list of places we recommend you to take your loved ones as a romantic gesture for the love you have. If you have to, please take this peculiar occasion woo your partner at one of these locations that have prepared events for you. Christopher Munyaneza is an established RnB singer who has been in the industry for almost seven years now. He has numerous hit songs and large fan base in Rwanda. His songs are mostly about love and relationships. He told Taarifa that he chose to do the concert on Valentines because the “day relates to the type of music I sing. I want to celebrate this day doing what I love and also bringing people who are in love together.” The entry price may be a bit on the high end for some, but hey dah? It is Radisson-Blu. What should we expect? Certainly not anything less than perfection and class. Be assured to get top-notch customer service the whole evening while sipping and biting on mouth-watering delicacies. We are told King James and Bruce Melody will be guest artists too. Yvan Buravan is an RnB singer who has taken Rwanda by storm. Since he joined the music industry in 2015, he has released hit songs and he is currently the talk of the town. He sings different genres of music including Zouk. His music will get you and your partner on the ‘dance’ floor grooving all night long. The prices are quite reasonable; compared to the unforgettable experience of spending the evening with your loved one while being serenated by the best in town! The venue is popular for unforgettable night life experiences. They usually have ‘Themed’ evenings most days of the week that appeal to different types of people and they always satisfy the diverse culture of people. The 5-Star hotel is not only giving the couples an unforgettable one-day experience but five days. If you want a place to have a luxurious three course dinner with the one you love at $100 or a dinner for two with a bottle of champagne, couple’s spa treatment and bed and breakfast at $450. From roses and chocolate to dinner and champagne, love can be costly and with the venue, be assured that everything will fall into place. If you want a laid back intimate and romantic evening away from too much noise Marriot is a good place to be. Ozone KCT together with Century Cinema have come together to create a perfect evening for memories. Movie, dinner and party is a good combination to shake the stress away at the same time enjoying the company of your loved one. DJ Diallo and Band will play the music and a glass of wine will be provided to boost the mood. Ozone, right in the heart of the city, has been there for some time now, but they recently revamped and expect them to sprinkle your experience with class. Slice & Cakes located on the first floor of Kigali Heights has been around since 2014. Their reputation precedes them as they are known around Kigali for their mouthwatering cakes. They have special offers and on they will be sizzling the day’s sweetness. Slice & Cakes has put together a perfect package that will put a smile on any lady. Roses are loved by many women and when they come from the perfect person, they signify way more than what can be put in words. Java House has been around for many years as the leading coffee house in Kenya and Uganda. It recently opened up in Rwanda and it has taken the country by storm by providing the best quality meals from the region. 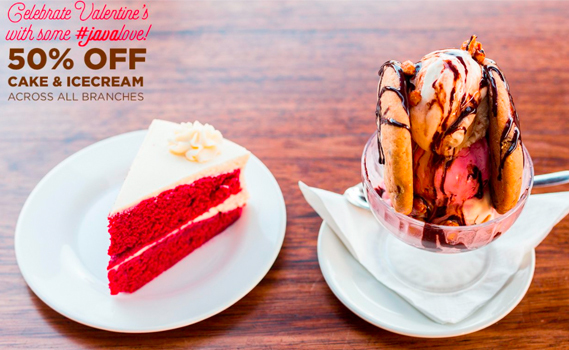 This Valentine’s Day, Java House is als o celebrating with the lovers by giving a 50% discount on cakes and Ice cream. You better dash there and “Yummy” your lover. Meanwhile, if you want to stay at home or if you are busy at work and you need to carry something with you after work or you need something delivered at home, Grocewheels can just do the delivery. We saw a few of their packages planned for Valentines, such as a flower gift set. Give them a call. If you have a few more places or ideas, please share with us and tag us on twitter @taarifarwanda or Facebook page @taarifarwanda and Intagram account @taarifarwanda.